There's something about the fall and baked apples. That warm cinnamony smell just warms up the whole house as the weather starts to get cool. I needed a quick dessert to go with a dinner I was making for the boyfriend and his younger brother. 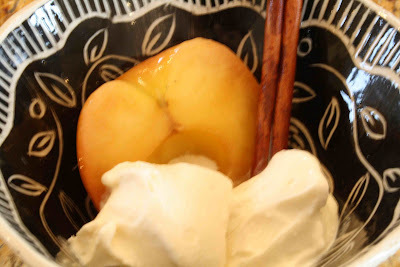 Baked apples are not only easy, but they take care of themselves in the oven while you focus on dinner. I served these with some vanilla ice cream and a cinnamon stick from the baking dish as a garnish. Mix the brown sugar, lemon juice and 1/4 cup of water together in a bowl. Slice each apple in half and core with a melon baller. Add the apples to the bowl and stir together with the brown sugar mixture. 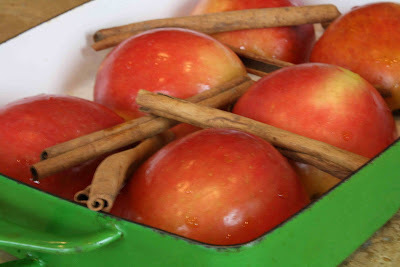 Place in a baking dish, cut-side down and place cinnamon sticks around the apples. Pour the remaining brown sugar mixture over the apples and cover the baking dish with foil. Place in the oven and cook for 20 minutes. Serve with vanilla ice cream (see below) and enjoy! I LOVE baked apples! They're so easy, yet delicious. When I was little, we'd bake apples wrapped in foil in the embers of the fire in the living room. You'd core them and pour honey and cinnamon (and sometimes raisins) into the middle and then wrap them up and stick them in the fire for 20min. Simple, but so delicious and in season. I bet it smelled wonderful. Talk about make your house smell good and cozy while they're baking. I'm waiting for it to get a little bit chillier and I'm going to bake some apples too. I love baked apples and the way they make the house smell. Gorgeous! I'm just loving fall foods right now and these are perfect. Thank you! I can smell them all the way here! Comfort is a baked apple dessert. I love baked apples. We do them every fall. Dorie has a fabulous recipe that we use!! Yours looks great too! Such a perfect quick dessert! Especially served with ice cream. Delicious! I just saw this recipe and am glad to see someone made it already. I always love how apples turn out when baked like this and the smell is divine. Beautiful pics as well!